Today we’re going Behind the Scenes of our video editing process! We all know how important editing can be for videos. Editing is what turns your drafts, screw-ups, and first takes into finished products. Before we get into how we do our edits, I am going to share something pretty personal with you. You may, or may not know that I present at conferences all over the world. So, I have a lot of experience with public speaking. Well, sometimes I screw up – actually, I screw up a lot! But these screw-ups aren’t always my fault. Sometimes the phone rings or a loud noise occurs outside my office. Sometimes, I get distracted because I am really excited to get into Google Analytics and show you some new stuff! Fortunately, we have a video editor on our team. And most of the time, he can fix my mistakes. Here are a few tricks we use in our video editing process to make me look and sound better on camera. Last week we took a look at our production studio for 90 challenge videos. 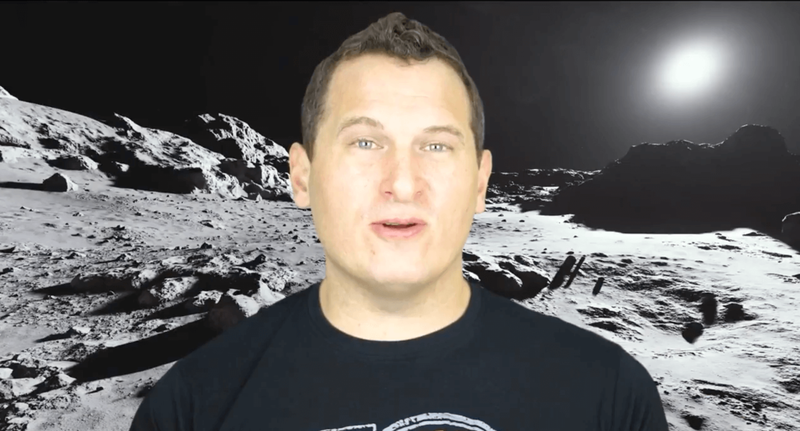 And I shared how I shoot our videos in front of a green screen. Green screen footage is great because it allows you to add in any backdrop you want. You can be at the beach, in the clouds, on a mountain, or maybe even on the moon. It’s an easy way to add a little fun to your video and create more engaging content. You may have noticed that I move around the screen during our videos. I might start on the left side and jump over to the right. Or you may have seen that we zoom in and out while I’m speaking. Moving me around your screen is how we fix those screw ups I was talking about earlier. I film multiple takes, without shutting off the camera. Then, our editor cuts and splices together the best takes. And to make our cuts and edits look intentional, he moves me around the screen. So essentially what I am saying is this: thanks to our video editor, I never really screw up! 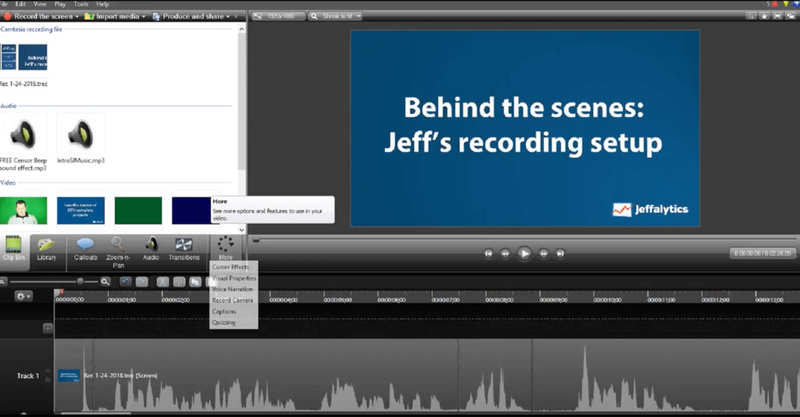 Camtasia is our preferred on-screen video capturing software. It’s the tool we use for all our screen cam footage and audio while I’m recording on my computer. It takes about 30 minutes of recording to get 15 minutes of good footage. So, our video editor has to cut out almost half of the content I record. When I am finished recording, we take the video and Camtasia files and clean up my work. When the screen is occupied with just plain text, all the attention is drawn to my voice. So, I need to sound like I’m talking from my head and my heart, and not as if I’m reading. What not to do with voiceovers! We’ve screwed up our voiceovers in the past by using a teleprompter to feed me my lines. The end product did not turn out well! Our video editor despised these recording so much he became clinically depressed. He compared editing our footage to watching the movie Waterworld on endless repeat. Jeff’s note: this was our editors joke. He’s not actually depressed. If your editor thinks your footage is garbage, and even dangerous to his health, it’s time to make a change. So, we went back to me ad-libbing and speaking from my heart. The ad-libs demand a little more editing time, but hopefully, the end product is more fun and engaging. Our videos almost always close with a call-to-action (CTA). Now, I usually get a little messy with my CTAs. I mean, the hard work is already done. The most important part of our videos is teaching a new skill and sharing information. I usually screw this part at least once or twice. And I have to do a handful of takes to get a decent CTA. Instead of leaving you with a cut together CTA on this post, we’ll wrap it up here. No CTAs, not a single one. Coming up next week – We go Behind the Scenes on our writing process. That’s write 😉 ! We are going to talk about one of the most important and useful subjects yet – COPYWRITING!! Mark your calendars. Next week’s post publishes on March 24th. Leave your phone number in the comments if you want me to text or call you when this post goes live. You’ll want to read this post. Then you’ll probably want to share it, print it out, frame it, maybe even keep a copy on your nightstand. Ok, that’s all. No CTAs – just blah, blah, blah. This post and video was episode 36 in our 90 Day Challenge digital marketing series.